Back at camp, she knows she has to chat with Alison to pull her into their alliance. Alison agrees, but she also goes to Mike and tells him exactly what is going on. Mike feels like this breaks the game wide open. He’s conflicted, though, because he’s been bonded to Nick for quite some time. Daybreak, and Davie is still determined to find an idol. He wanders around and as always, it’s super easy to find. BUT it’s just a clue that tells him to go to the spot of the merge feast, which is where he’ll find an advantage. He waits until it’s raining and heads over to the feast area. He actually finds an idol that is GUARANTEED good for the next Tribal Council. He can risk his vote to smash an urn and extend his idol’s power for up to two more votes. This is a huge risk. Davie really does go through all the potential mathematical permutations in his head. Eventually, he puts his faith in God. He prays for a sign, and hopes the fire will point toward an urn. It points the other way, so he hangs onto his idol for the next vote – he can either play it for himself or for Christian as needed. Probst again. Obviously, this Immunity Challenge is crucial. It’s the one where they have to balance a ball on a disk while also balancing on a narrow perch. The disk can’t touch their body. After one round, everyone is safe. Now, they’ll all add a second ball to balance on the disk. With two balls, it’s much more difficult, and Kara and Angelina fall off. Then, Davie and Christian fall. Alison, Nick, and Mike are still competing. Mike is shaky, but suddenly Nick loses control, leaving Goliaths Mike and Alison to duke it out to the end! Round three, and they have to balance one, two, three! Yes, three lovely balls! By the way, Probst makes a number of super immature balls references. We won’t dignify them by repeating them. Even though Mike’s balls are moving (! ), Alison’s fall. Mike wins immunity. He has much to think about, too, as he has a hugely impactful vote tonight. After the challenge, Kara is amused that everyone wants to eliminate Alison. Mike wants to make a big impact on the game, though. He believes (correctly) that Christian is the person to vote out tonight. He tries to argue the point with Alison, Kara, and Nick, but none of them seem to be convinced. Playing straight into Davie’s hands, Nick tells him that he really only does have one idol. Since Nick was truthful with Davie, he now wants to target Alison. Mike decides to go to Christian and tell him that Davie is gunning for him. Instead of convincing Nick to swap over to Christian, it instead sends him toward Davie. For once, this is really not an “It’s Anyone But…” situation. And it’s Tribal Council time. Gabby actually smiles huge at everyone. Nick talks about how hard everyone is playing, while Probst tries to talk strategy, which is the same conversation he’s had a million times before. Trust? Lies? So many! Davie says it’s a “mind frenzy” and that the game has to be played tribal to tribal. The game is fluid. You know why he, Davie, Christian, and Nick are doing so well? They see the game as ever changing and adapt from day to day. Christian does note that the record for votes received by a player who makes it to the end is 19. Christian is currently at 15. He uses this as an argument about his vulnerability and someone that you’d want to take to the end, but it likely proves how much of a threat he is. It’s voting time. Will anyone play an idol? Davie, obviously. He plays it for himself. Nick plays his… fake one, trying to get a read on the tribe. He plays his real one for himself after looking everyone in the eye. So… two votes Alison, two votes Christian. AND… it’s Christian. Mike White, everyone! 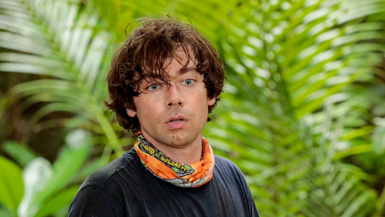 Our Amazing Race/Napoleon Dynamite friend has really brought the big game the last two episodes. If they’re smart, they get rid of him next.